Will the registries and breed clubs roll over on cropping and docking? Are cropped breeds declining due to expense? Your COMMENTS on this report! What is your club doing - or not doing today? When this article ran in 2009 we received a lot of feedback from people in breeds that have cropped ears and/or docked tails as in breeds such as Rottweilers and Cockers which only dock the tail. Breeders (and owners) are struggling in the battle against the purely political agenda of animal rights. Some national parent club members are reporting the club has been "infiltrated" by those who seek to change the club policy, its stance on cropping and docking, and even to change the Breed Standard. Where does your parent club stand today? Does your current board still support cropped ears and docked tails? 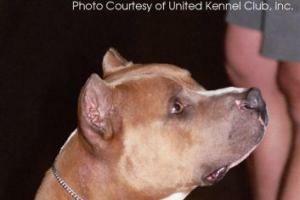 Do your breed leaders suggest the club shouldn't require people to mutilate their dogs? Has your national breed club membership dropped? Is cropping and/or docking an issue in your breed today? Has the public moved on to another breed? Tell us in COMMENTS section below. What have been the effects of the push for "natural" ears and tails? Is the debate really about "animal rights" or is it just personal preference or outdated custom? Is a Great Dane just a skinny mastiff? Have we, as dog people, stood firm against changing breed standards or is there something to this cruelty thing? This editor's first show dogs were Dobermans (Damasyn and vom Ahrtal) in the sixties. I learned to do tails and dewclaws from Wayne Gooch, pro handler and DPCA Delegate. Ear cropping was done by our vet. How utterly senseless to think that docking a tail or cropping ears is cruelty compared to the pain and irrevocable damage to the hormone and immune system caused by cutting out a dog's uterus or testicles! Most dog breeders do tails and dewclaws at home, not to save vet bills, but because it is quicker and easier (especially on the dam!) Breeders can more accurately fit tail length to breed and adult structure. But here's an example of what breeders face - New York Assembly bill 7218 (a $500 fine for any vet that cropped or docked a dog) didn't pass but other anti-cropping-docking bills are pending. Is your state moving towards making it illegal for owners to crop and dock? Do you know of veterinarians who refuse to crop or dock, or who charge outrageous fees to do the simple surgery? What happened to legislation that was in the works to make it illegal to show a cropped or docked dog in NY, PA, and CA? Bring us up to date in COMMENTS below. In docked breeds, long tails will change the identifiable profile of the breed, the SET of the tail and consequently, the croup will drop and that will affect movement.. In cropped breeds, long ears will not change the structure but will make a softer expression acceptable, and consequently softer temperaments will become the norm. There is no reasonable reason to stop docking tails or cropping ears as compared to hormonal health and surgical risk of castration or hysterectomy. If properly performed, dewclaw removal and/or docking tails at home is practically painless (the nervous system is minimally developed at that age), presents no exposure to disease which is unavoidable at the vet's office, and causes less stress to the dam. There is no need for so much as a single stitch, just a little dab of Quick Stop. 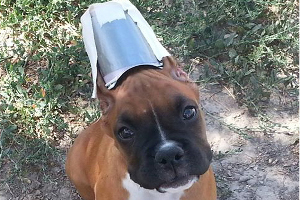 For breeders or owners who dread the expense and the possibility of flopped ears or extended taping, modern science offers solutions. Parent clubs that accede to the demands to ban crop-dock are as guilty of promoting "animal rights" as is ii AKC Judge Ted Paul. Actually, they are more at fault because a national breed club should maintain and protect the breed standard. And there is this rebuttal to "leaving ears natural, as nature intended." Our offices received this astute observation from Georgette Curran in Nov 2014 "AND AS FAR AS NATURAL EARS..... NATURAL EARS ARE 'ERECT'.... AS YOU WILL NEVER FIND A DROPPED EAR IN THE WILD. DROPPED EARS ARE HUMAN MADE." COMMENTS HAVE CLOSED, thanks to our readers for their replies, please see below. Dog Advocate: Stop cutting up perfectly healthy dogs. The beauty and grace of these dogs are from the attributes they were born with, not from the abuses of inhumane beings. And yes there are humane ways to sterilize a dog also. Contact: 600milliondogs.org Concentrate on stopping the dog meat trade, and leave these dogs the way God gave them. Emma: @Laura - sorry for the misunderstanding. Congratulations on your AKC champion WITH tail! Emma: So, dogs should be docked to help judges? Why not improve quality of judges instead? I am not a judge, but can easily tell a Rottweiler from a Labrador, both have tails in Europe. James: Floppy ears, for example, may look adorable on dogs and rabbits, but they actually are a result of malformed ear cartilage. An animal hoping to hear well isn't going to benefit from having the ear flopped down alongside its face. Joe: "The history of breeding is rich in this sort of thing, you breed selectively for one trait and often get something unexpected that is linked to it in some unanticipated way," Adam Wilkins of the Institute of Theoretical Biology in Berlin, lead author of a paper in the journal Genetics, pointed out in an email. Surprises like floppy ears were unanticipated, but were they a bad thing? "I think not," Wilkins said. "In the case of domesticated animals, most of them would not survive very well in the wild if they were released, but in captivity they do perfectly well and while the traits of the "domestication syndrome" are technically defects, they do not seem to harm them. Laura: There ARE judges who think a Rottweiler with a tail looks like a Labrador. They've said it OUT LOUD, and in writing. Now those are judges I wouldn't walk across the street to show to, if they can't make a distinction between those two breeds just because of the tail!! Jeff: For anyone, judge or otherwise, who can't tell a purebred from a mix because of cropping or docking ... Well. They don't know dogs very well. Away a day and come back to these comments! Wow. I'm here because I love purebred dogs. Docked. Cropped or not. Final time. Ear health is related to cropping. Read the AVMA data. Soft look ears? Tell that to the flop eared guard dogs. Geez folks. If you don't like ears and tails, have what you like. Just stay out of my business if I prefer natural. It's solely aesthetic choices. Medically. Not related. Emma: "I don't want people walking up to me and saying, oh, what kind of dog is that, it must be a mixed breed" - and that is your reason for mutilating an animal? Personal vanity? And you call that love? Laura: cherifell said "NO ONE CAN TAKE AWAY MY RIGHT TO PERSONAL PREFERENCE." cherifell, you are absolutely right. But the anti-tail/crop "groups" have tried very hard to take away MY personal preference to own a tailed Rottweiler, by fighting to keep a written description of a natural tail out of our standard. Why is that okay? I've asked from the beginning, why the fear of docked and natural tails competing in the show ring together? If the docked dog is a better dog than the tailed dog, then by all means, it should win. AND VICE VERSA!! 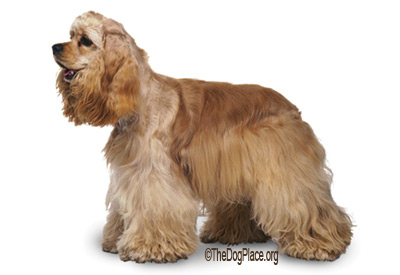 EVERY AKC standard for breeds with previous cropped ears/docked tails should be changed to include descriptions of uncropped ears/undocked tails. Then people would have the right to enter their dogs, without discrimination, and may the best dog win!!! Oh, and BTW--I am VERY thankful that there are OPEN MINDED judges out there that can judge and award a good dog PERIOD. These judges would ALWAYS get my entry. Anonymous: When I walk down the ring at a show or outside in the yard, or wherever I am with my dogs, Dobie, Yorkie I don't want people walking up to me and saying, oh, what kind of dog is that ,it must be a mixed breed dog, or it doesn't look like a Dobie, it has long tails, droopy ears! When I walk out into the world with my champions, I want to walk proudly with my breed that looks like the breed that I love to begin with. And yes it does matter with health issues long ears flop, get wet inside causes ear infections with the tail docked and ears done on the Dobie, they walk with pride If I had wanted a mixed breed whatever to whoever, I would have gone to the local pound. cherifell: I think this debate will go on forever. It boils down to individuality whether one dog beats its tail on the wall or if the floppy eared dog gets ear infections. It's also personal preference whether you like the crop/docked look or not. I certainly won't apologize to anyone for my personal preference. NO ONE CAN TAKE AWAY MY RIGHT TO PERSONAL PREFERENCE. They can take away my right to crop/dock. I LOVE the look of a well conformed, oversized, crop/docked guard breed but as much as I dislike it, those who oppose crop/dock will eventually win with information based on medical fact not personal preference. Bad guys will learn uncropped guard dogs still have teeth. I love all breeds of dogs and want to own as many of my favorite breeds in my lifetime as I can but looks like I will never get to own a beautiful crop/docked Doberman and I won't own a Doberman with floppy ears and whip tail nor will I own a Rottweiler with a tail. My biggest fear? The precedence being set for the demise of the pet. Lately it seems like my favorite saying is "I'm glad I won't be around long enough to see the end of ____". You fill in the blank with your favorite things. Disgusted Brit: First let me say that agreed with the comments and sadness the first year a flop eared Dane appeared at group level. Not one person in our judges group like the "look" and all agreed a breed bred to protect is more laughable than threatening when it has drop ears. It changes the look of the dog and projects a soft character as in our beloved spaniels. The demand for Alsatians and Belgians immediately shot up. My judge friends must keep low profile on this issue but there, I have had my say on behalf of the mother country of your terrier breeds and an unarmed populace that feels very unsafe without guarding breeds that look the part. Emma: I am glad cropping and docking is no longer allowed in Germany and many neighboring countries. As far as I know FCI standards don't allow wording in standards that request cropping/docking. When cropping was still done in the early eighties, my mom bred Yorkshires. I asked her not to cut off the tails as I felt it was cruel. They squeaked. She advised me, the puppies had to get their tails docked in order to get pedigrees. I am happy it is forbidden over here. BARB BAKER: Dobermans ears and tail cropping has been done for years you cannot neuter a male or spay a female with a surgery done.. Is not what we are suppose to do is control dog population as far as ear docking and tails the dogs look fine as they are....I have raised and bred dogs for many years and I always went by the ALC ruling... Not everyone has show ring dogs. Jeff: Thanks Emma. The Rottweiler is as popular there as ever. There are likely as many tailed Rottweilers here in the US as docked. Just search on the web. The difference is that what most see in the show ring are docked. Emma: I am from Germany. Cropping of ears was prohibited by law in 1987, docking of tails was prohibited in 1998. There is an exception for hunting dogs, but I think this is under review. People are happy with their natural dogs. Great Danes and Dobermanns are still popular breeds. It seems to be common practice for breeders in the US to sell companion dogs on a spay/neuter agreement. Breeders over here don't do that. People only neuter their dogs, if there is an indication to do that (e.g. pyometra). KK: I have no problem with ear cropping and tail docking. I also have no problem with dew claw removal. Cropping is done under anesthesia and is no more painful than a spay or neuter of a dog. I have owned cropped/docked breeds all my life. I *want* them to be cropped or docked as called by the breed standard. My working dogs still do work for a living, they are docked and/or cropped for this reason and are not shown in conformation shows. Glad there are still vets out there that will do this and glad that there are still breeders who are not afraid to continue this practice. Jeff: @Anonymous 2. That is too bad, but your board cannot demand anything in this area about its members and their choices for their dogs. If they do try and force people to dock or crop to show, report them to AKC. Yes, such a mindset decimates clubs and the sport. Some small minded folks would like a club for "the breed" to be their handful of people all thinking alike. Well parent clubs represent that breed, ALL of that breed in this country and as such a small clutch of people cannot demand you do or not do anything as it relates to you and decisions for your dogs related to presentation and showing. If you need help please email me. AKC in fact has taken a better position ..all judges must examine and judge ALL specimens docked, cropped or natural brought to them regardless of the standard on the ears and tails. Anonymous 2: My breed board still supports cropping and docking, more like they DEMAND it and if you don't they will go to great lengths to eradicate you from the club, and show ring. The club leaders insist that members dock & crop, there is no room for compromise in their small minds. Not only has the national club membership decreased but the breeds rankings with the AKC continue to plummet, though I don't think this fact is because of the docking & cropping issue, I believe it to more related because of the negative personalities of the officers and board members. They do not want new people in the breed. New people and fresh ideas are not met with open minds. Docking and Cropping are definitely an issue with my breed club, deep lines have been drawn in the sand by the club and if you dare cross over to the other side you had better be prepared for the most vile and unsportsmanlike fight of your life, be prepared to hire an attorney, you'll need one. And then there is the AKC that is in a position to resolve the issue, but they continue to do nothing. Jeff: There may be anecdotal cases. But no. Generally not. 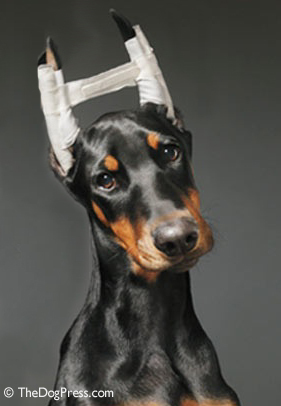 Please read the AVMA site on ear issues and cropping. I have a cropped Griff right now with ear infections. Does that mean cropping caused it? No. As I said. If cropping made ears healthy all breeds would be cropped. Jim Perry: I had Great Danes for 25 years. I also train all breeds. I know from experience that cropped ears are healthier than drop ears due to air flow. With a drop eared dog, the owner must clean the ears regularly to avoid moisture build-up. 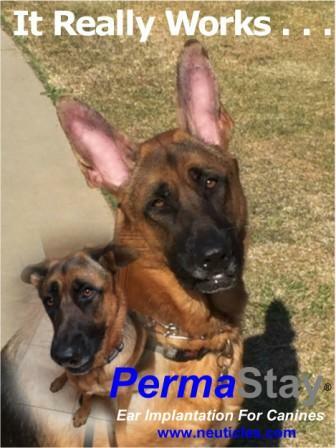 With any erect ear breed, the owners know they stay dryer and healthier. Anonymous Response: Chris, cropping and docking serves a very real purpose. It is not strictly "aesthetic". A cropped ear will not foster infection the way a dropped ear will. My champion Labrador suffered his entire life with ear infections caused by his heavy dropped ear. If I could have cropped him, I would have. After he passed away, I threw away hundreds of dollars in ear remedies. I spent thousands of dollars in vet bills in regards to his ear infections. I also have Dobermans and if they are not docked, they can hit thing with their tails and open them up. Yes, docking and cropping does have practical uses. Chris: I find it extremely disappointing that the reason for cropping or docking is to make a pretty line. It’s a total BS answer. And when people say that I know that they are mired in nostalgia and place little emphasis on canine welfare. There is no reasonable reason to continue docking and cropping. Dogs don't beat their tails until their bloody, they don't get them bitten off in bull fights. So many breeds are not docked and clipped that suggesting not doing it will negatively effect tail set is just absurd. I feel its like continuing to argue with Flies about the meaning on Judge Judy. The breed standard for my breed has accepted undocked tails, although they don't seem to know what to do when judging full tails. And more pet owners want the tail, because they see that archaic practice of docking as what it is, pointless. Oddly enough, we don't spay/neuter to make a dog pretty. We do it to keep them from breeding. We crop ears and tails for no reason other than aesthetics, and it has no justification. No educated one anyway. Jeff: The vast majority of ALL service dogs are ....Labs and Goldens ......Guess what? They all have tails! So much for the perceived risk of some door slamming tail injury. If that were some real issue all dogs would be docked. As for ear health, the AVMA site has debunked that theory, long espoused as some reason to force people to crop .There is simply no statistical scientific proof cropped ears are "healthier" ...If there were vets would be raking in the cash and telling all breeds to crop. Watch Cropping/Docking videos on why the simple procedure is necessary to the preservation of breed type and/or function. You will also see that tail docking (done before pain receptors are fully developed) and ear cropping (done under general anesthesia) are neither painful nor cruel. History, effects, and debate - why crop ears and dock tails? Would you let some political activist change your breed?